Make it Cheaper 5 out of 5 Review: Thanks for making me one happy customer, I definitely wouldn't have found such a great deal without your help. Not only did this save time but everything was explained thoroughly which I appreciated. Your team are always willing to help and assist me in any way possible. Make it Cheaper 5 out of 5 Review: Literally one phone call, ten minutes of my time and voila - big savings. I highly recommend this service. Thank you MIC! Make it Cheaper 5 out of 5 Review: I found the process easy to understand & the young lady I spoke with couldn't have been more helpful. overall a good experience. Make it Cheaper 5 out of 5 Review: Make It Cheaper organised my account details and new supply package with the most professional expertise and prompt time frame. The courteous representative was a pleasure to deal with. Highly recommend! 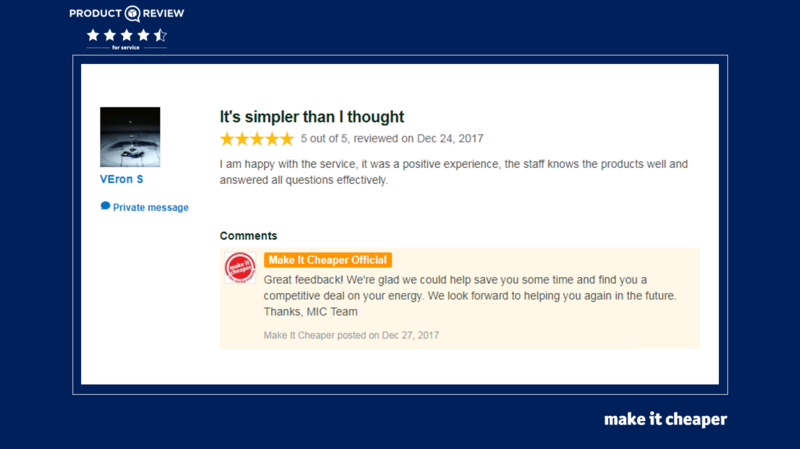 Make it Cheaper 5 out of 5 Review: Very pleasant , hassle free , knowledgeable staff member , answered my questions clearly in a manner I understood. Happy to deal with you again. 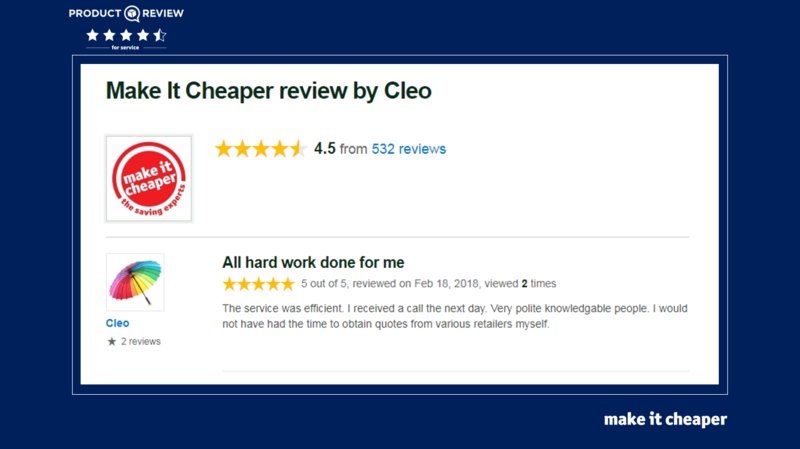 Make it Cheaper 5 out of 5 Review: Very happy with the outcome The work was done for me. Life is busy and I feel we would not have switched if we had to find the time to research. 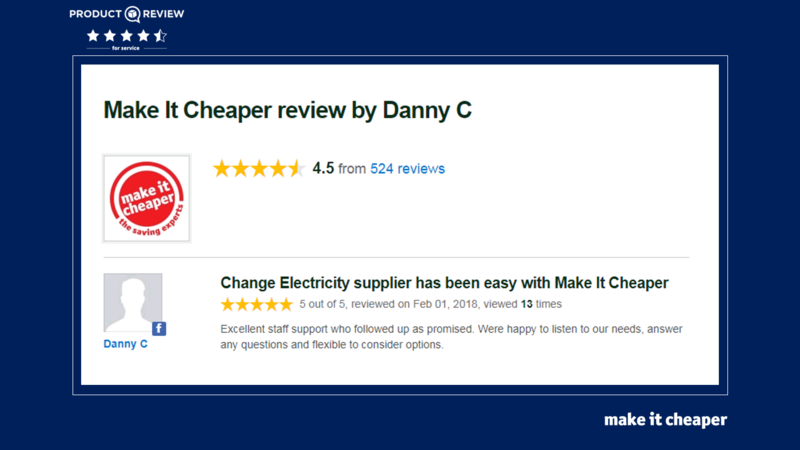 Make it Cheaper 5 out of 5 Review: Helped me to understand how our charges worked with existing supplier since getting solar recently. Great to speak to someone I could clearly hear and understand. Made the change over very simple and found us huge savings. Make it Cheaper 5 out of 5 Review: Very pleasant to deal with. 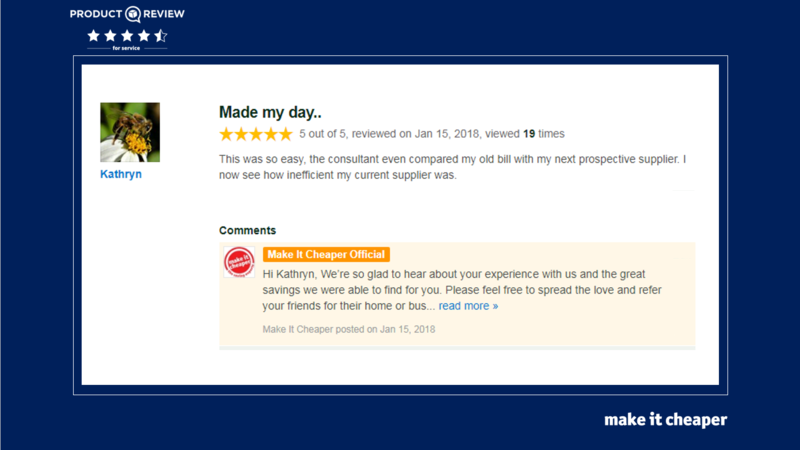 Thoroughly recommend everyone to compare their bills through make it cheaper. Thank you for saving me on my power bill. 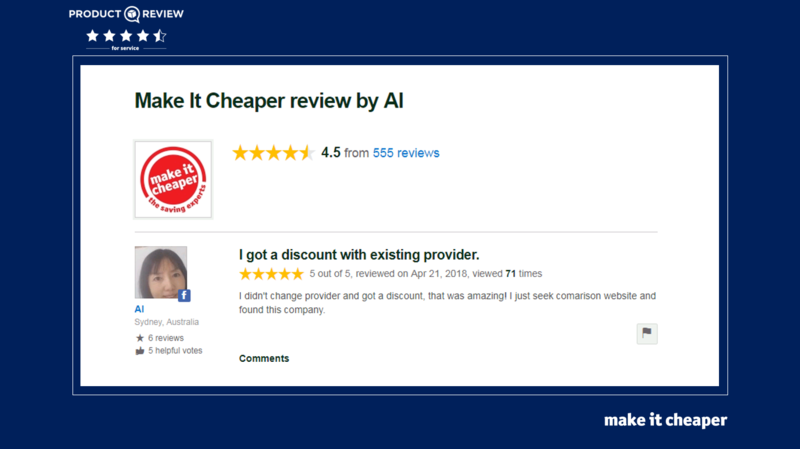 Make it Cheaper 5 out of 5 Review: I didn't change provider and got a discount, that was amazing! I just seek comparison website and found this company. 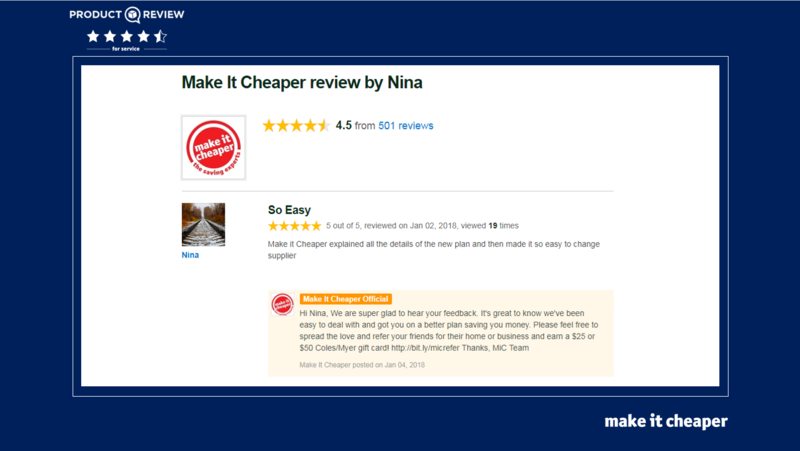 Make it Cheaper 5 out of 5 Review: Easy process to go through which does n't takes lots of time. Friendly and very helpful staff. Better deal with fewer money - what could be better! 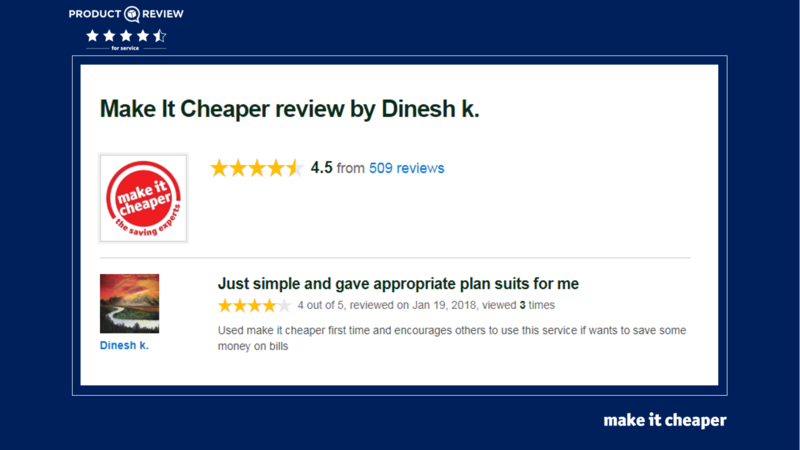 Make it Cheaper 5 out of 5 Review: I loved the ease of switching providers as everything was done for me and I didn’t have to spend days researching complicated plans. I am also saving a substantial amount of money. Highly recommend Make It Cheaper. Make it Cheaper 5 out of 5 Review: Very helpful customer service, Rishi was very informative & has very good people skills. He also has a good sense of humour. Make it Cheaper 5 out of 5 Review: Great Service, from start to finish things were simple and easy. The staff were friendly and helpful. Would recommend, thank you. Make it Cheaper 5 out of 5 Review: Electricity in Australia is far too expensive. Competition is very important to reduce the cost of living domestically. Make It Cheaper was efficient. Make it Cheaper 5 out of 5 Review: It was great to actually have a comparison done over the phone and it didn't take very long at all - the staff go through all aspects and are really helpful. Very Honest And Efficient Team! Make it Cheaper 5 out of 5 Review: Very great team working in this company! From the sales for being so honest and informative to accounts that are highly efficient in returning your queries. I never experienced such smooth transferring with any electricity providers until I met these company! Highly recommended! Thank you for all the help! 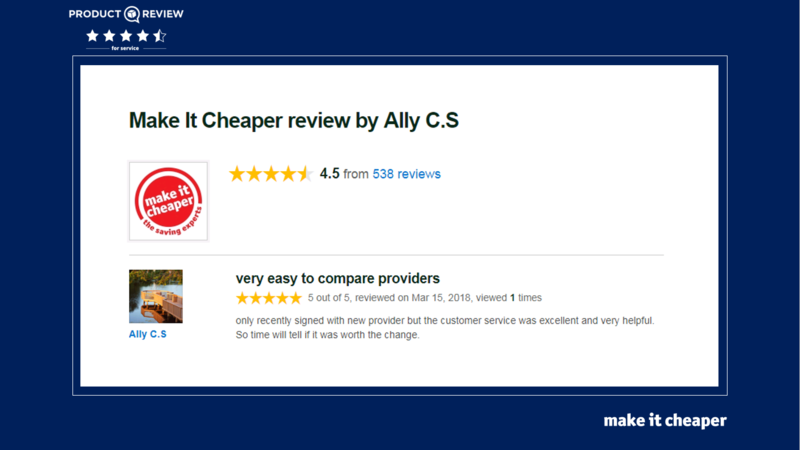 Make it Cheaper 5 out of 5 Review: Only recently signed with new provider but the customer service was excellent and very helpful. So time will tell if it was worth the change. Make it Cheaper 5 out of 5 Review: Staff very helpful and pleasant. Follow up to make sure that everything was proceeding with supplier. Service that brings back the old customer relation feeling. 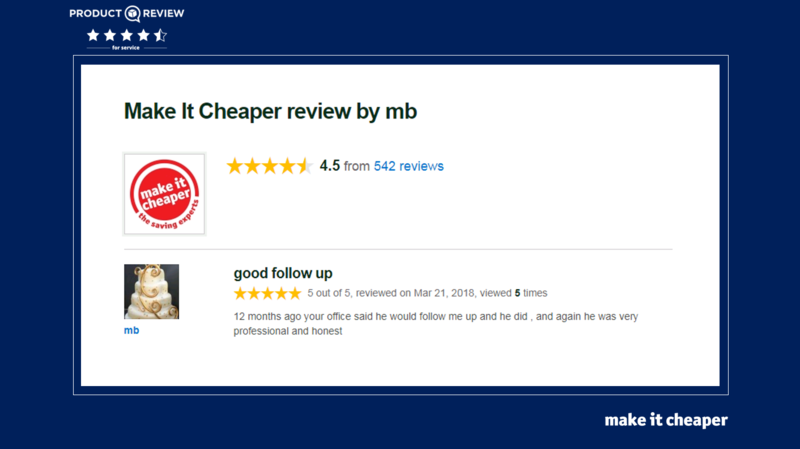 Make it Cheaper 5 out of 5 Review: I sought out 2nd opinion & satisfied my curiosity re best deal available and have now no reason to use any other services. Make it Cheaper 5 out of 5 Review: I found the information provided to be helpful and professional making it easy to make any decision on my choice of service provider. Make it Cheaper 5 out of 5 Review: The service was efficient. I received a call the next day. Very polite knowledgeable people. I would not have had the time to obtain quotes from various retailers myself. Make it Cheaper 5 out of 5 Review: I managed to save a total of 25% and stay with my current provider. Great service, very helpful, transparent and knowledgeable. Make it Cheaper are paid by the retailers so it was free with no obligation to engage their services. Very happy with the service. Thank you. Make it Cheaper 5 out of 5 Review: Simple. Easy. I feel that I am getting comprehensive information on which to base a decision. Real Savings every time. 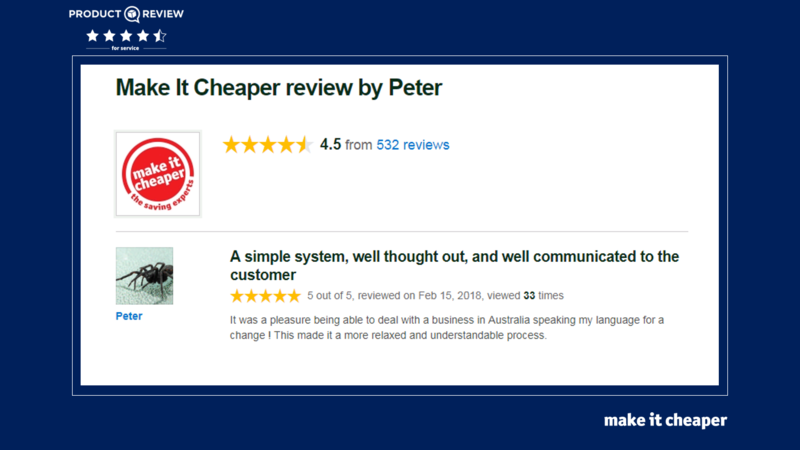 Make it Cheaper 5 out of 5 Review: It was a pleasure being able to deal with a business in Australia speaking my language for a change ! This made it a more relaxed and understandable process. Make it Cheaper 5 out of 5 Review: Make it cheaper made it easy to save on power costs. it save you running around to different suppliers to get your comparison costs. 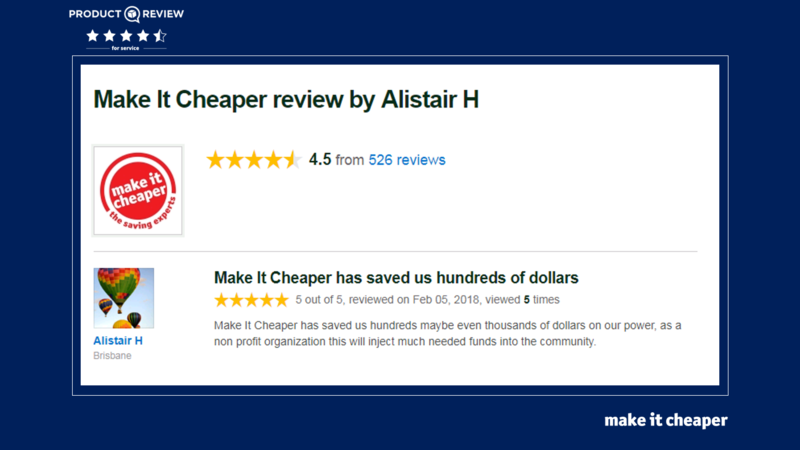 Make it Cheaper 5 out of 5 Review: Make It Cheaper has saved us hundreds maybe even thousands of dollars on our power, as a non profit organization this will inject much needed funds into the community. Friendly, Fast And Efficient Service. Thank You. Make it Cheaper 5 out of 5 Review: It was a pleasure dealing with Andy from Make It Cheaper. 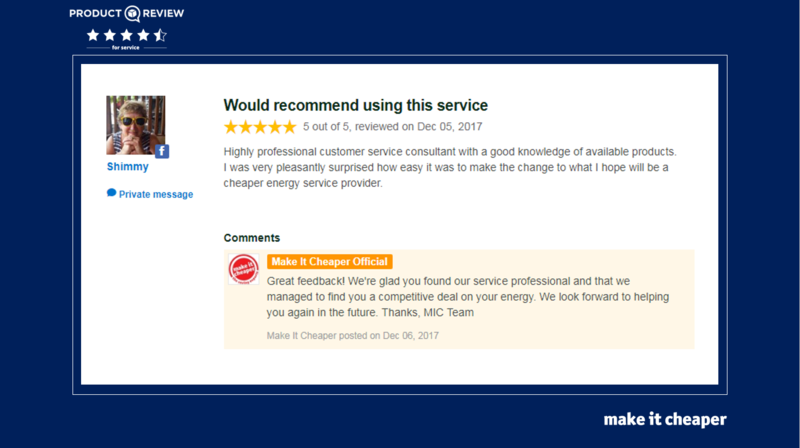 I dread changing energy companies as it is boring and time wasting but Make It Cheaper was not only friendly but fast and efficient. They did all of the hard work and the rest was easy. 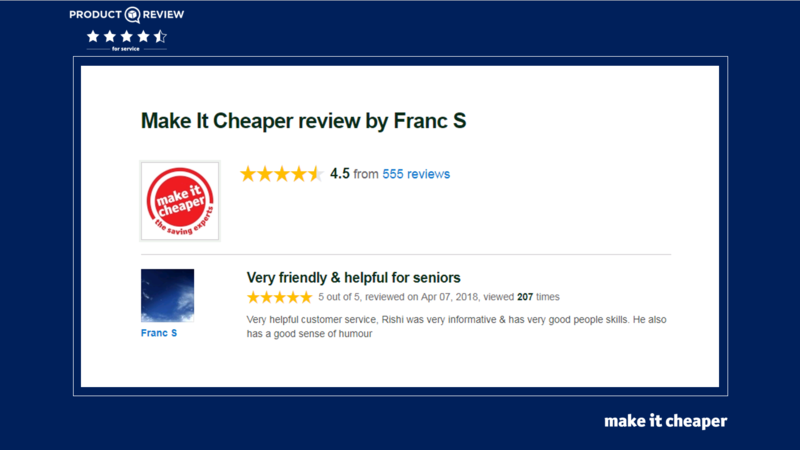 Make it Cheaper 5 out of 5 Review: Excellent staff support who followed up as promised. Were happy to listen to our needs, answer any questions and flexible to consider options. Make it Cheaper 5 out of 5 Review: Excellent service and staff. Prompt in their paperwork. Explained things in simple terms and researched lower rates for me along with maintaining me on the same rate for my solar panels. Highly recommend Make it Cheaper. Cheaper & Easier Is The Way To Go. Make it Cheaper 5 out of 5 Review: I like the way the research to find the cheapest energy providers are handled, with the minimum of fuss and time consumed. 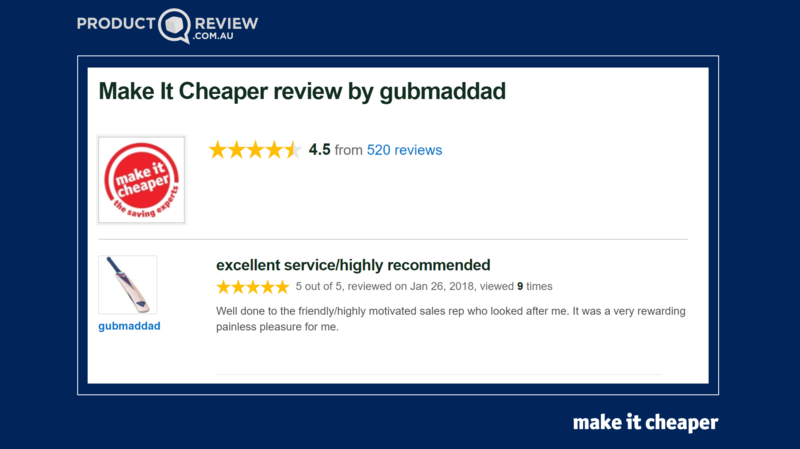 Make it Cheaper 5 out of 5 Review: Well done to the friendly/highly motivated sales rep who looked after me. It was a very rewarding painless pleasure for me. 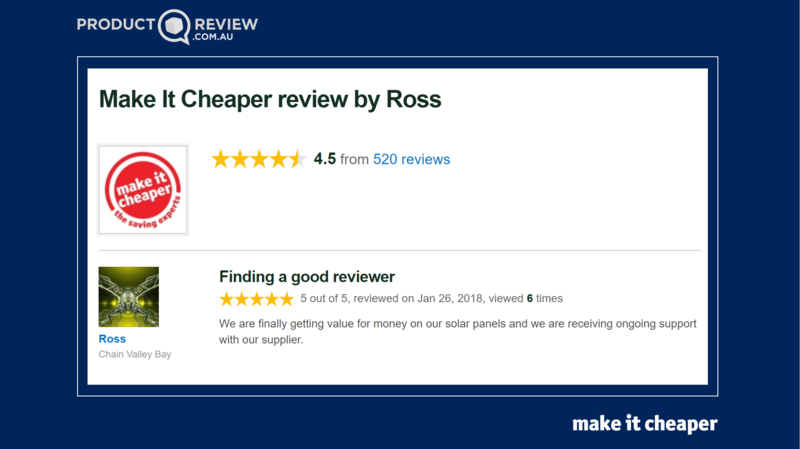 Make it Cheaper 5 out of 5 Review: We are finally getting value for money on our solar panels and we are receiving ongoing support with our supplier. Make It Cheaper Is SO Easy. Make it Cheaper 5 out of 5 Review: All details were deal with, with respect, and such a caring and happy manner. Felt like I was asking a friend to help with this account. It was all done and dusted with no dramas. Make it Cheaper 5 out of 5 Review: I always dread talking with Marketing people on the phone, cause they make it so complicated and talk about a lot of things. But with the consultant at Make it Cheaper, he made it sound so easy and straight to the point. No wasted time as I was in the office working during that switch. 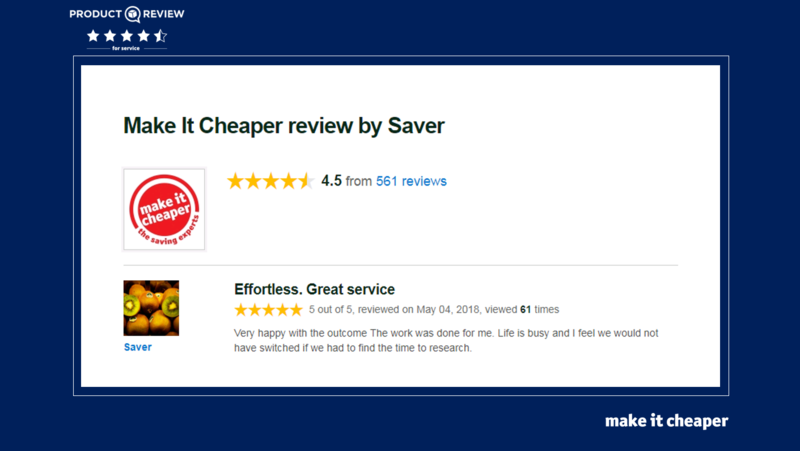 Make it Cheaper 5 out of 5 Review: Used make it cheaper first time and encourages others to use this service if wants to save some money on bills. Make it Cheaper 5 out of 5 Review: Fast, efficient and easy. They did all the work for me at no cost to myself. Just savings. Happy customer. Make it Cheaper 5 out of 5 Review: This was so easy, the consultant even compared my old bill with my next prospective supplier. I now see how inefficient my current supplier was. Make it Cheaper 5 out of 5 Review: Could not believe how easy Make It Cheaper made it to obtain a better deal with our supplier. The staff made it easy and a pleasure to deal with. I have already recommended to friends to contact Make It Cheaper. Very highly recommended. 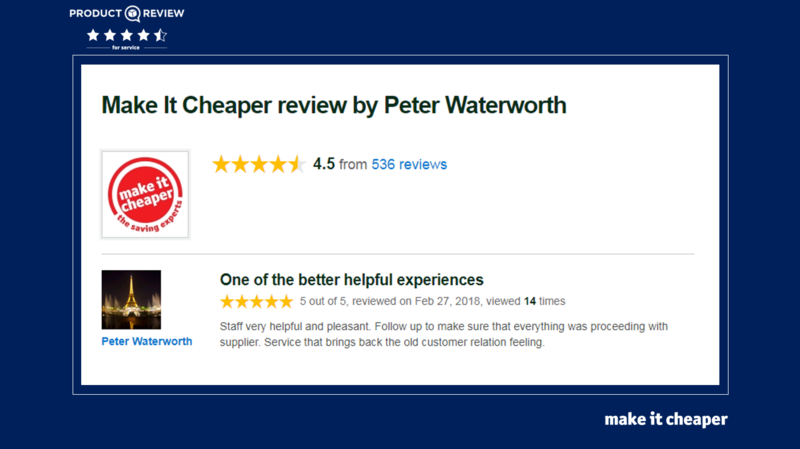 Make it Cheaper 5 out of 5 Review: Thanks to Operations Executive for such efficient and courteous discussion. Well done, obviously enjoys her work and is a business asset. 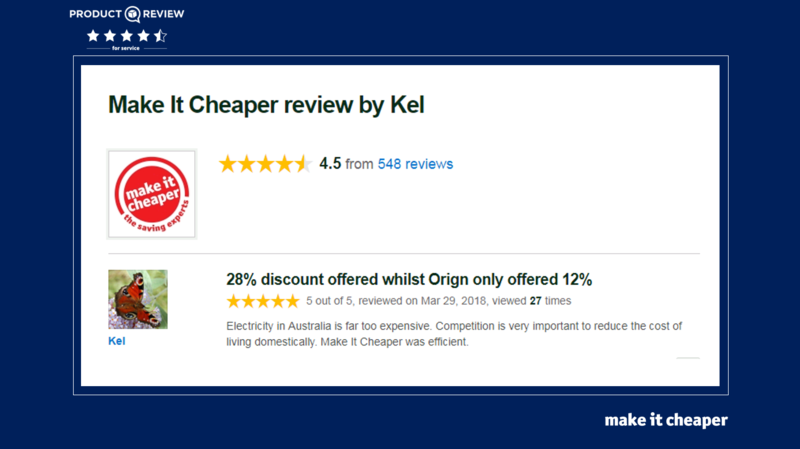 Make it Cheaper 5 out of 5 Review: This was a good experience. I switched from a longstanding electricity provider whose bills had escalated in the previous 2-3 years to another for both business and household, with estimated savings of $1,500 per annum. Make it Cheaper 5 out of 5 Review: Used to dread pushy sales people for energy products but speaking with Samantha Money was a pleasure. She was knowledgeable, more interested in what I want and using her knowledge to match my wants with the best product on offer. She was not at all pushy and allowed me the time to think and decide and then confirm with her. I would definitely recommend anyone looking for a good deal to contact them. Make it Cheaper 5 out of 5 Review: I am happy with the service, it was a positive experience, the staff knows the products well and answered all questions effectively. Make it Cheaper 5 out of 5 Review: Ask the question and you get the right advice! Service was very prompt and efficient and would consider using them again next time! Make it Cheaper 5 out of 5 Review: Simple easy phone call to help the business save money. They gave us several options to consider. Would highly recommend to anyone. Make it Cheaper 5 out of 5 Review: Easy to get the best deal and save money on Energy bills.Very helpful and informative customer service.Guys use make it cheaper and profit yourselves. Thanks!! 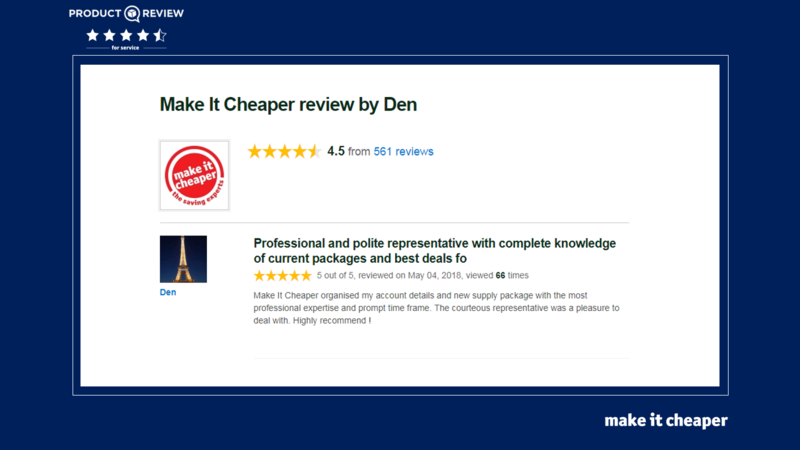 Make it Cheaper 5 out of 5 Review: Make it Cheaper were great. Very friendly, helpful and made it very easy to save money. Would highly recommend to anyone. Make it Cheaper 5 out of 5 Review: Highly professional customer service consultant with a good knowledge of available products. I was very pleasantly surprised how easy it was to make the change to what I hope will be a cheaper energy service provider.